Will Britton went close for Skegness. Any thoughts that Skegness Town may have had about life in their new league being easy were soon put to bed at picturesque Selby. The Lilywhites got off to a bright start against a team that narrowly missed out on the Division One play-offs last season. But they were made to pay for gifting the home side too much time and space at crucial moments in the game and Selby needed no second invitation. Indeed, things looked bright for the seasiders when Will Britton stung the fingers of the home keeper Peter Lawrie within the first minute of the match. 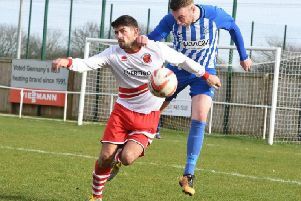 But Travis Portas needed to be brave and alert at the other end to punch out a header from Skegness forward Jacob Fenton after a third minute free kick was swung into the box from the Selby left. The warning signs continued and Portas got down well to his right to deny Sam Cable whose shot fizzed towards the bottom corner of his goal. Selby were by now in the ascendancy and the Lilywhites struggled to keep possession, forcing them to work extra hard without the ball in the sweltering conditions. The visitors will have taken heart when Britton broke clear of his marker in the 20th minute, but he attempted lob from an acute angle was thwarted by Lawrie. Cable eventually broke the deadlock after 25 minutes when defenders backed off, inviting him to the edge of their penalty area. His low hard drive found the bottom corner past the fingertips of a despairing Portas. As the players battled in the searing heat, referee Alex Sawden invited them to take on water, but this failed to dampen the threat from Cable, who threatened with another screamer inches over the Skegness crossbar. Jamie Elstom resorted to desperate measures to try to halt the tide of Selby attacks and was yellow carded by Mr Sawden in stoppage time at the end of the first half for his late challenge. Just before the half time whistle Cable missed a golden opportunity to double the lead when he headed over a corner while unchallenged. He didn’t take long to make up for his error. Indeed the second half was only three minutes old when he tapped in unmarked at the far post. Harry Bunce, who had been given a torrid afternoon by Cable, was replaced by Corey Cunliffe, who couldn’t prevent the fleet-footed Cable completing his hat-trick on the hour. Daniel Stevens was caught in possession by Gary Collier, who raced to the by-line and crossed for his teammate to tap in. Cable’s unlikely to bag an easier treble all season. The pressure was relentless and the visitors had barely drawn breath when Collier added a fourth goal. Home centre forward Carl Stewart crashed another shot against the Skegness cross bar before picking up a yellow card for a foul on George Hobbins. Alex Nichols, a half time replacement for Elstom, had chances to reduce arrears, the best one falling at his feet with 15 minutes to go when Cunliffe flicked on Nicky Frost’s corner at the near post. Unfortunately for the Skegness striker he wasn’t able to get the ball from under his feet and Lawrie was able to smother the danger. At the other end Portas prevented further damage when he dived to his left to keep out a shot from home sub Ras Diamond jnr. Among the pluses for Lilywhites boss Martyn Bunce was the performance of new signing Callum Robinson, who looked assured on the ball. His composed display was only marred by one moment of petulance when he retaliated after a heavy tackle, earning himself a yellow card, screamed for by the home keeper. Bunce was disappointed that for much of the game Skegness missed out Robinson and his fellow midfielders in their build-up play. “We didn’t play through our midfield enough,” he commented after the game. The long ball tactic did gift possession to their opponents and curtail the opportunities for their forwards to get on the ball. TOWN: Portas, Warren, Robinson, Hobbins, Stevens, Bunce, Fidling, Frost, Britton, Fenton, Elstom, Cunliffe, Drysdale, Nichols, Payne.